oh piccolo sogno ... how i've longed to visit you. and finally, i have! josh & i decided to do a date night ... on the first night of regular season football, much to josh's chagrin. oops. but that's okay ... summer was coming to a close & i wanted to sit outside at the famous piccolo sogno patio! so we had to go! at least, that's how i justified it. so off we went to the river west neighborhood (the grand, halsted & milwaukee six corners, to be exact) for some cucina italiana. per the website : "piccolo sogno features a menu of fresh, seasonal rustic italian cuisine ... from homemade pastas & hand-tossed pizzas prepared in the restaurant's wood-burning oven to roman-style pork & mediterranean sea bass [ed. note : not applicable to vegans] -- as well as homemade gelato & sorbet." lovely! 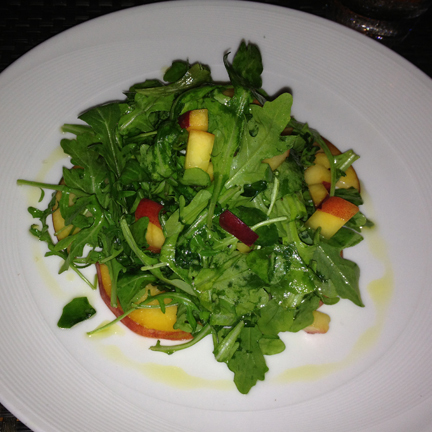 peaches, baby arugula & lemon oil. i've been on a peach kick for the past couple of weeks, so i had to get this. light + fresh. a winning combination. there were some other salad options that could be vegan-ized, but again ... had to go with the pesche. olive oil + every vegetable ever grown ... fava beans, peas, carrots, cauliflower, sun-dried tomatoes, zucchini, yellow squash, etc. etc. etc. literally every vegetable known to (wo)man was tossed in this dish ... except mushrooms. duh. 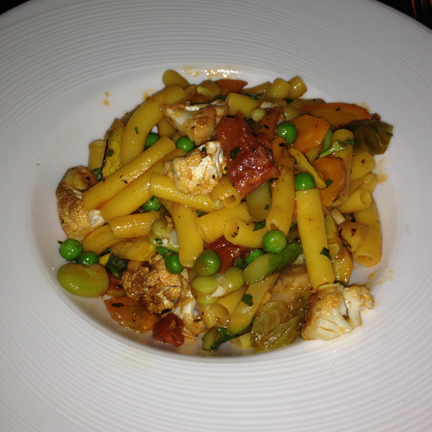 the pasta was fab & reminded me of the gluten-free kind i had at the rosebud. (could be the same!) all in all, just a perfect bowl of veggies + noodles. the stanley cup stopped by! too full for actual dessert - so a photo of the 2013 stanley cup (as won by the chicago blackhawks!) was equally delicious. piccolo sogno is one of those classic chicago restaurants -- need a reservation long in advance, always a wait, fantastic food. now that it's getting chilly out, i'd hold off on a visit until the warmer months to sit on the patio. but once spring/summer hits, get over there asap for some tastiness.